When I upgraded the tires on my Jeep Wrangler I loved the look, but driving became scary – would I be able to stop in time if need be, and furthermore, would I be racking up red light tickets because I’m rolling out into the intersection? I decided to upgrade my brakes before I had to find out the hard way, and the obvious choice was the Teraflex Big Brake Kit. There’s no lack of brake upgrades on the market these days, but one of the most comprehensive (and popular) kits is the Teraflex Big Brake Kit – it’s a very complete kit that does exactly what it promises. There are two different flavors of the Teraflex Big Brake kit, and all feature the same oversize twin-piston brake caliper. This twin piston caliper is the heart of the big brake upgrade, as it allows more force to be applied to the rotors, resulting in the Jeep slowing much faster. 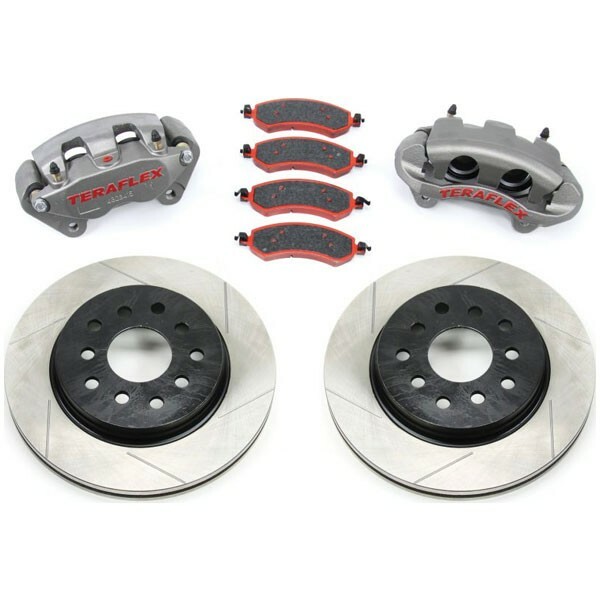 Both kits come with 13.3″ mill-balanced vented rotors. These rotors are larger than stock, and have dual wheel bolt pattern 5 on 5″ and 5 on 5.5″ allows for use on multiple styles of wheels. You can also upgrade to drilled and slotted rotors, if you prefer. At the end of the day, the Teraflex Big Brake Upgrade is light years better than the factory setup, and is a great upgrade if you are having braking issues. 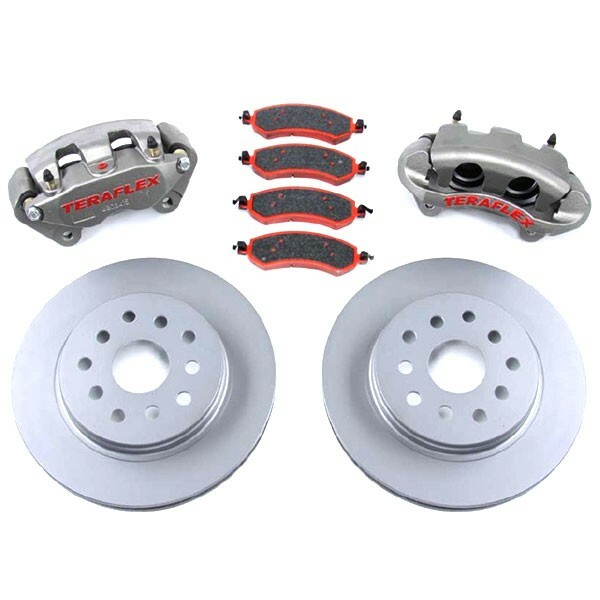 The only downside is that you are switching to a proprietary caliper, pad and rotor, so you won’t be able to get replacements at the local parts store – if this is a concern then you may just order and extra set of pads to have at hand. Keep in mind, that if you have a 2007, 2008, or 2011 JK, you’ll be required to upgrade your master cylinder – all other years have this as an optional upgrade. The simple upgrade installation requires no cutting, welding or adapter bracketry. It is a simple bolt-on upgrade! 2009 and 2010 JK Models do not require the Heavy Duty Master Cylinder, but will benefit from its use. In the event of no availability of the Heavy-Duty Master Cylinder, the 2009/2010 master cylinder can be used on the 2007/2008 models to gain a more acceptable pedal feel and function.